Despite rallying late to get to within one run, the No. 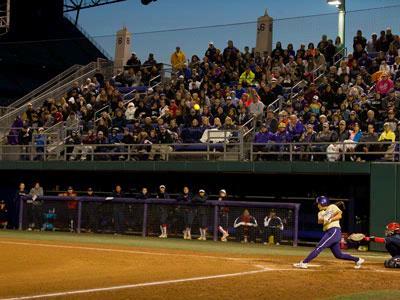 11-ranked University of Washington softball team lost the series opener to No. 18 Arizona, 8-4 on Saturday (April 2) at Husky Softball Stadium in front of a nearly sold-out crowd of 1,470 fans. The Huskies trailed by five after allowing a five-run third-inning but chipped away at the Wildcats' advantage with a run in the fourth and three in the fifth. Senior Kimberlee Souza highlighted the Huskies’ production from the plate, recorded a pair of RBI while hitting her sixth home run of the season in the fourth. Sophomore Taylor Van Zee went 2-for-3 while junior Ali Aguilar also tallied a pair of hits for her team-leading 12th multi-hit effort. Freshman RHP Taran Alvelo took the loss in the circle, falling to 12-5 on the season. The Husky hurler struck out six while allowing 10 hits, five walks and eight runs in a complete-game effort. After two scoreless frames, Arizona took advantage of three hits, including a three-run home run, and two walks to jump out to a 5-0 lead in the third. A leadoff walk and a hit put a pair on before a two-RBI double plated the first runs of the game. An out and a walk later, the Wildcats hit a home run to take a 5-0 lead. Washington put a runner on in each of the opening three innings, but struggled to find a rhythm and score until Souza delivered a solo home run in the fourth. Trailing 5-1, the Huskies narrowed the gap with a three-run fifth after a three up, three down inning for Alvelo and the defense. Freshman Morganne Flores smoked a single off the wall to open the frame and a fielder’s choice and back-to-back walks loaded the bases. Aguilar then delivered an RBI single and in the next at-bat, a groundout to second scored sophomore Trysten Melhart. In her first at-bat since March 6, senior Courtney Gano came in to pinch hit and answered with an infield single to score Washington’s third run of the inning and get the Huskies to within one run. Arizona got all of those runs back in the fifth inning, taking advantage of another leadoff walk and three hits. After a pair of singles loaded the bases, the Wildcats hit a two-RBI double and then scored another run off back-to-back walks. Washington left a pair of runners stranded in the sixth before going down in order in the seventh as Arizona won game one of the three-game series, 8-4. The Huskies and Wildcats continue play tomorrow (April 3) at Husky Softball Stadium. First pitch is set for 7 p.m. and the game will be aired live on the Pac-12 Networks.